If you know me, you know that I was completely against facebook when it was first launched. I had many friends asking me to join...I always said a very firm "no"...why would I want to put my life out on the internet? But then, slowly slowly, I found that my friends were not sending as many emails as before, or were not calling me as much. I was totally out of the loop and could not understand why...that is, until I joined facebook. Now I not only use it almost daily to find out the current gossip and even weather in Georgia and beyond, but it makes me feel closer to my roots. I love seeing faces from all parts of my life on a daily basis, learning what everyone is up to, and keeping abreast of all my favorite people and products out there in the world. 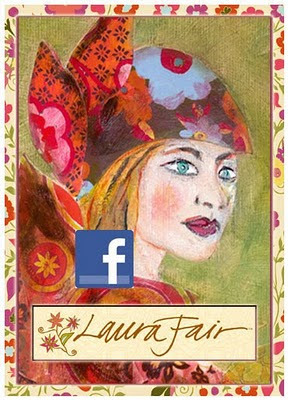 Thus the natural progression...Laura Fair is now on facebook! I know, I started feeling guilty about adding what seemed to be "business" to my personal page, the only solution was to open up the official "Laura Fair" page. Now I can update you without guilt on the goings on of my designs and new product launches. So come on over and "like" me if you are there...and invite some friends too! I am even planning some giveaways and special prizes for those of you who like me the most...yes, I am not above resorting to bribery!